Another orbit completed, and new equipment! This week I celebrated riding the earth to another complete orbit around the sun…yeehaw! I am looking forward very much to this next orbit, or year, if you want to look at it that way. But my number is high and I’d rather not think in terms of years, not right now. I have a tradition of acquiring for myself fun but useful “tools” for my birthday; basically I buy myself a “big” present (usually planned and budgeted in advance…’cause I think I am smart like that). Description: the new “birthday” items are two PreSonus Eros 8″ powered studio monitors and the Behringer iStudio iPad audio interface. 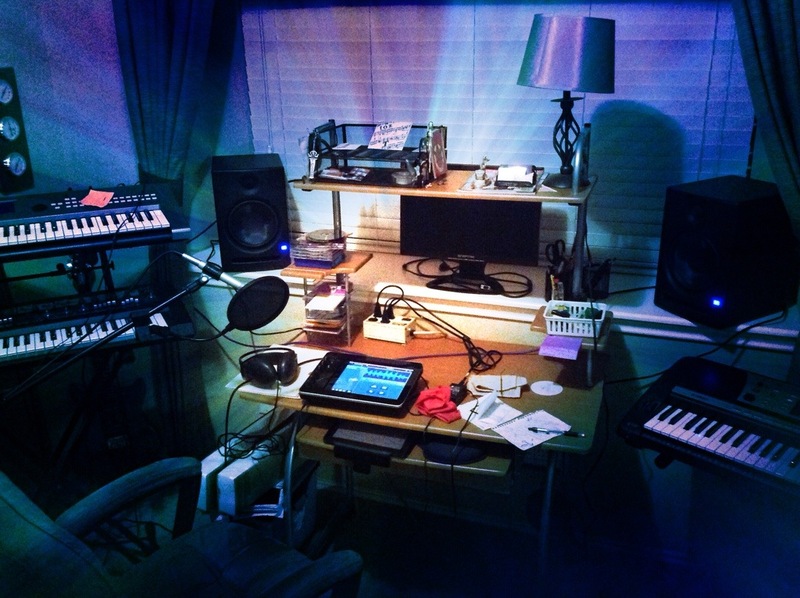 Also seen in the image are a Yamaha MM6 Synth/workstation, Roland SH-201 Synth, and on the right is the Yamaha PSR740 keyboard workstation (circa 1999, complete with still functioning 3.5″ floppy disc drive). The iStudio interface works fine for both iPad 2 (for which it is designed) and the iPad4 using a lightening to 30 pin adapter. With connections for MIDI in and out and audio-in, I can actually (technically) have all three keyboards active at once, though I haven’t tried that yet. But I have used a phantom powered mic and it sounds terrific in the pads. The main emphasis for me was on getting high quality sounds out from the pads and into studio monitors (via TRS cables), and it works brilliantly. The PreSonus monitors sound fantastic. Having MIDI in-out, two combo inputs (XLR/TRS), aux in, USB MIDI, 2 foot switches and video out make this a complete set up. The Behringer iStudio had dropped in price to $99 (US), so after months of semi-exhaustive research, I took the plunge and am quite satisfied. Heck, just getting half of those functions for the price would be a good deal. This home studio is not a studio in real life; it’s a home office where I work. But I access my work on remote mainframe computers via a notebook PC, so the work footprint in this space is very small. Mostly I contend with the room being used for storage space. The issue is how to make it the best listening space that I can (cheaply). I don’t record much through the microphone so making it a good recording space isn’t a priority as much as making it a good listening space. It’s an ongoing project, but it sounds really good and I am happy with the set up so far. What does this mean for my iOS music making? More and better! Well, I will make better sounds with the use of the new equipment and the whole set up makes it easier and more interesting to mix and master. I can’t say it will make my music better, but hopefully I will do more work on crafting and finishing songs then I do on generating song ideas. Either way it should help me to grow as I continue on my music making journey. MIDI in and out allows me to control many of the iPad apps with my keyboard and the other way around, I can play the tone generators of the Yamaha synths via iPad apps (or just by themselves) and then record those sounds into one of the high quality DAWs running on the pad, such as Cubasis or Auria. The Yamaha MM6 and PSR740 both are very powerful workstations with many splendid voices, actually some are quite beautiful and the MM6 voices include many based on the Yamaha Motif Series. Both keyboards have a multitude of tweak-able effects (reverb, chorus, DSP, etc) along with dozens of rhythm patterns, and the MM6 has over 200 arpeggio types from which to choose. With the iStudio interface I am going back to my keyboards and not to use as just very expensive iPad MIDI controllers, but as the tone generators that they are. I see this as having gained access to over 1,200 combined voices and more than 30 drum kits — all new to my iOS music making. This means that for sound producing, app and hardware-wise, I should be set for a long time. Performance and composition tool apps should be the only things on my app wish-list. So another side benefit to staying in-house, so to speak, with sound generation (for now) is that I should be able to cut down on my app lust. I hope to get a “music resources” article finished and posted soon, meanwhile I am busily checking out all the new features of my setup and having fun exploring some new and old sounds.